Discussion in 'Cars in General' started by GTPNewsWire, Feb 11, 2019. This article was published by Andrew Evans (@Famine) on February 11th, 2019 in the Car Culture category. TenEightyOne, darth_tails and Danoff like this. My wonderful daily car is a 1990 vspec in brg. I had no idea that Le Mans car existed, but I find myself wanting one. I always thought the Le Mans celebration model would have been more suited to an RX7 (or even a Cosmo) since, you know, rotary power. LongbowX and Cytoria like this. Just over a year ago I was in Tokyo. A friend and I were heading home after a long night at an arcade in Yokohama when I saw a Miata coupe behind a building. TheNuvolari, carracerptp, ImaRobot and 7 others like this. There is one rare model missing from that list. Australian only MX-5 SP from 2000/2001. Most powerfully Mazda backed MX-5 ever sold and there were only 101 of them built. Mine's a 1995 Merlot in... Merlot. TheNuvolari, darth_tails and Populuxe Cowboy like this. The RF version is a nice looking sports car. the Roadster GT League event again with it. 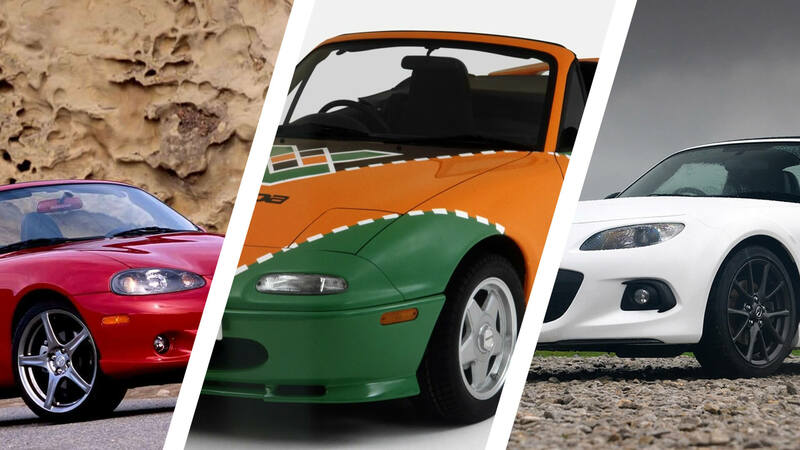 Spot each site's Mazda/MX-5 nerd! VXR, ImaRobot, Populuxe Cowboy and 1 other person like this. Multiply them by three so you can get their Gran Turismo representation. Fun fact, they didn't strip down the paint on the Le Mans editions before painting them. One guy came across a black NA 5 and whilst he was doing some body work on it sanded it down to come across the orange paint underneath. Also, there's a 30k miles Coupe for sale at the moment - for £30,000! Unsurprisingly that one (in Hong Kong?) has been on sale for a little while now. They're rare, but when I've seen them come up actually in Japan they're not £30k cars just yet.